Day-to-day weather features such as fronts and troughs, highs and lows constantly wash against New Zealand in the global atmospheric circulation. Sometimes the weather in New Zealand is highly changeable, changing from heavy rain to blue skies with an almost daily frequency. Other times the weather can seem to be stuck one way or another for days. In this blog we discuss the reason for this: Planetary waves, also known as Rossby waves. We will also look at the tools forecasters have to analyse them, and the implications for New Zealand. Sometimes New Zealand gets a rapid succession of fronts, such as in this situation where a trough approaches from the south while an old occluded front remains over the north. Image produced using WeatherScape software. The atmosphere is a fluid. And like a glass of water, if you move it, waves develop on the surface. The air in the atmosphere is highly compressible, so these waves lead to areas of higher and lower density, which result in pressure differences at the surface. Most of the movement in the atmosphere is thermally driven by heating from the sun. So in a sense more like boiling a jug than shaking a glass of water. The planet receives much more heat at the equator than at the poles, and the atmosphere is always working to even out this imbalance and transport the excess energy to the poles. If it didn’t then the tropics would continually get hotter and the poles continually cooler. Image showing the transport of heat away from the equator. This circulation is known as the Hadley cell. Image by Chris Webster, MetService. This all means we can think of the atmosphere as a series of waves on the surface of the earth. Just like waves on water, smaller ripples overlay (superpose) larger waves, and can travel through them without significantly changing them. The smaller ripples on a water wave are equivalent to the smaller scale weather features such as fronts and troughs that extend across relatively small distances on the globe. The larger waves that these overlay are planetary waves, also known as Rossby Waves after their discovery by Carl-Gustaf Rossby. Another good analogy would be harmonics on a musical instrument. If an instrument is playing middle C, then something on the instrument is vibrating at 262Hz (262 times per second). If this was the only part vibrating, the note would be very clear, but it would impossible to tell what instrument it was coming from as it would have no character (timbre, in musical terms). In reality parts of the instrument body vibrate at multiple harmonic frequencies, and it is the relative ratios of these harmonics that gives each instrument its individual sound. 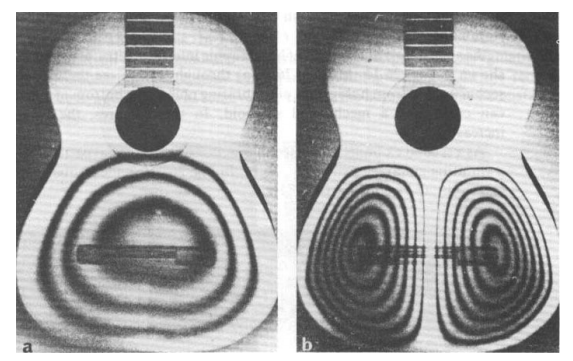 The image below, from Molin & Stetson, Institute of Optical Research, Stockholm, 1971, uses holographic interferometry to show the vibrations in a guitar resonating at 185Hz and 285Hz. When played normally, these modes of vibration will overlap and combine with many other higher frequency modes, giving the guitar its characteristic sound. Planetary waves are the fundamental ‘notes’ on which the characteristic higher frequency fronts and features play out. While a forecaster could never write a forecast from planetary waves alone, they give a good insight into whether fronts and troughs will rapidly sweep over the country, whether they can be expected to weaken or strengthen in an area, or whether conditions are likely to remain similar for a few days. By filtering out the small scale details from computer models of the atmosphere, we can strip away the weather and make the large scale planetary waves visible. A Hovmöller diagram is a chart which plots pressure on a given latitude around the earth. Often this pressure is filtered to only include the contribution from larger planetary waves. The vertical axis shows time down the page, and the horizontal axis shows longitude. An example is shown below. Higher than average pressures are shown in pink and lower than usual pressures are portrayed in blue. The vertical axis is in days, so D +5 is model data for 5 days in the future, while D -10 is historic data from ten days previous. Over the top of the blue and pink areas are thin contours showing the contribution from smaller-scale waves. Hovmoller Diagram produced at MetService, NZ. In this example we see that for the last twelve days the planetary waves have remained in pretty much the same place over New Zealand, which corresponds to a high pressure which lay over the Tasman Sea and New Zealand for the first part of April 2016. We call this a ‘blocking high’ – when a planetary scale high pressure remains stationary over an area. This leads to prolonged settled conditions under the planetary high, weakening any fronts that move into it. Areas upstream of the planetary high tend to get an increase in rain and wind as fronts slow down as they reach the blocking high. Areas of planetary high pressure are sometimes called planetary ridges, and similarly areas of planetary low pressure are called planetary troughs. Also in the diagram above, on top of the pink and blue planetary waves are thin contours showing medium scale waves. These appear to track diagonally across the chart, showing that as time progresses they are moving to the east. This corresponds to several fronts that tracked east, but weakened across New Zealand under the planetary ridge. Using planetary wave analysis, we can identify common set-ups and identify the characteristic types of weather that they bring to New Zealand. Fronts and lows are deflected around the blocking high, leaving New Zealand relatively free of major weather-producing features (but not necessarily of fog, morning drizzle, or low cloud). Fronts weaken as they cross the Tasman Sea or become deflected towards the southeast. Generally good weather persists over New Zealand. This is a more active situation for New Zealand. Fronts moving from Australia can appear mild, but become more active as they cross the Tasman Sea. 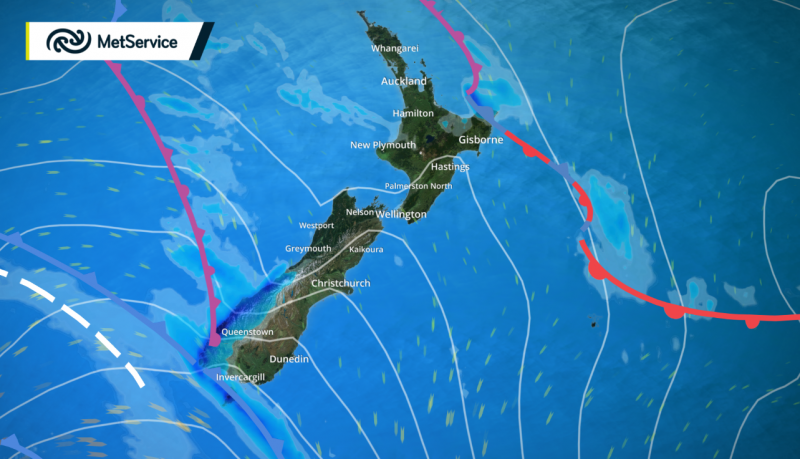 The fronts may then cross New Zealand bringing short but intense weather events. These highs often have persistent moist easterlies to the north of them, bringing low cloud bases to eastern regions and possibly heavy rain to eastern areas of the North Island. Fronts cross the Tasman Sea and decelerate as they approach New Zealand, leading to what is known as a 'frontal graveyard'. The remnants of fronts can linger over western areas for several days, bringing unsettled weather and/or heavy rain. During summer a discontinuous belt of high pressure – known as a subtropical ridge – moves south, often falling over the latitudes of central New Zealand. This leads to an increase in blocking highs, and prolonged spells of fine weather over New Zealand. In autumn this high-pressure belt slowly retreats north and encourages a westerly flow across much of New Zealand. This limits blocking situations, and is conducive to more mobile weather features over the country. During winter, the prevailing westerlies can take the odd break, often after an extremely cold polar outbreak. This is known as the winter blocking high, and these typically mean long spells of clear, crisp or even frosty weather, but can also lead to persistent low cloud with drizzle, known as anti-cyclonic gloom. In spring, the fierce westerly winds tend to dominate over New Zealand, with rapidly moving weather systems really packing a punch. The chart below shows the three month mean sea level pressure anomaly (MSLP anomaly), which is the difference between the recent pressure averaged over the last three months, and the average long-term pressure at this time of year. The time span of the chart is for the three months between 9th January 2016 and 9th April 2016. This shows a high pressure (red) sat over and to the east of New Zealand. The long term trend for summer 2016 was a blocking high to the east, which led to a relatively dry summer in the east but several wet spells in the west (see Implications for New Zealand, above). However, this blocking pattern had broken down once we moved into April, as we can see from the Hovmöller diagram earlier in this blog, which showed a high over and to the west of New Zealand between the 1st and 11th of April. Image showing mean sea level pressure anomaly from 9th January to 9th April 2016. Image produced by the NOAA/ESRL Physical Sciences Division, Boulder Colorado from their Web site at http://www.esrl.noaa.gov/psd/. While planetary waves are not something that most people will notice or be directly impacted by, they are an essential tool for meteorologists. Knowing the planetary set up sets the ‘big picture’ for all of the short and long term forecasts that meteorologists write on a daily basis.